Tag line: "Your favorite creeps...together again!" We open in a cemetery, the fog hugging the ground as mourners line a freshly-dug grave to say goodbye to one of their own. The ceremony completed, the group slowly shuffles off, leaving the undertakers to complete their task. It’s a familiar enough beginning, one you’d find in any number of scary movies. But there's more to this film than horror; the moment the family and friends of the deceased are gone, the two undertakers tip the casket, dropping only the body into the open hole (thus preserving the coffin for later use). At this point, the tone of the movie switches as the action speeds up to a frenzied pace (a la The Benny Hill Show), with the morticians tossing dirt into the grave as quickly as possible to cover up their deception. It’s a humorous start to a movie that will live up to its title, The Comedy of Terrors. The deceitful undertakers are Waldo Trumbull (Vincent Price) and his assistant, Felix Gillie (Peter Lorre), and they’re cutting corners because business has been kinda slow lately. Having inherited the small enterprise from his father-in-law Amos Hinchley (Boris Karloff), Trumbull is having a hard time making a go of it, and to add to his misery he quarrels often with his wife, former opera singer Amaryllis (Joyce Jameson). When the landlord, John Black (Basil Rathbone), demands that he pay his past due rent, Trumbull decides to take matters into his own hands. So, that night, he and Gillie set off to murder someone, thus “creating” a new customer for them to bury. Oddly enough, the victim they eventually settle upon is none other than John Black himself! But when the stubborn Mr. Black refuses to die, Trumbull has no choice but to get a bit “creative” to get the job done. 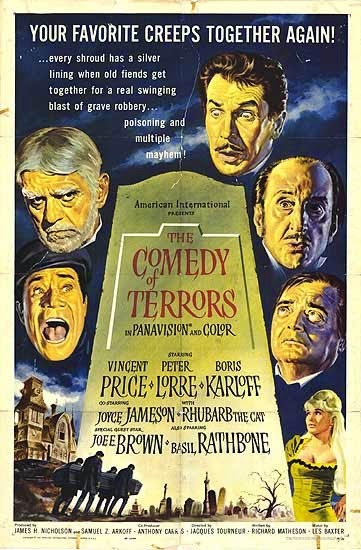 Despite featuring Vincent Price, Peter Lorre, and Boris Karloff, 1963’s The Comedy of Terrors, Like The Raven before it, emphasizes guffaws over screams, and while most everyone gets in on the fun (Karloff’s Amos, a senile old man, has his moments; and Rathbone seems to be lampooning himself by playing John Black as a hammy Shakespearean actor, spouting off lines from MacBeth for no apparent reason), it’s Price who delivers most of the movie’s laughs. A nasty, self-centered cad, Trumbull insults his wife on a regular basis (when Amaryllis talks of how her father liked to collect “curious objects” from around the world, Trumbull snaps back “He did more than collect curious objects, madam. He also fathered one!”). What’s more, he blackmails the elderly Gillie (who escaped from prison some time ago), forcing him to take an active part in his various illegal activities (many of their scenes together have a slapstick vibe, with an obvious double standing in for the aging Lorre when the action heats up). Having played his share of tortured souls in movies like House of Wax and The Pit and the Pendulum, Price clearly relished the chance to portray a comedic jerk, and he makes the most of the opportunity. Aside from its three stars (all horror icons in their own right), The Comedy of Terrors was also directed by Jacques Tourneur (who helmed such classic scare flicks as the original Cat People and I Walked with a Zombie), and written by Richard Matheson, who, along with his science fiction output, penned the scripts for Spielberg’s Duel as well as The Legend of Hell House, and the 4th (and best) segment of Twilight Zone: The Movie, “Nightmare at 20,000 Feet”. With talent like this, you’d think The Comedy of Terrors would have been a bone-fide horror film. That fact that it’s a good comedy instead is a testament to its cast and crew, who prove that jokes and terror are more closely linked than most people imagine.